Plot: Colonel Alister Lethbridge-Stewart is managing the paperwork following the Great Intelligence’s invasion of London, including transporting the evacuated population back to their homes, while planning his upcoming marriage. Everything goes out the window when a chain of strange events bring him back to his hometown where the GI is marshalling its forces for another strike. Review: Straight off the bat, for those unfamiliar with The Brig, the main character of this novel is Lethbridge-Stewart, a colleague of the Doctor from Doctor Who. Originally appearing in the series as a Colonel played by Nicholas Courtney, he was later promoted to Brigadier and was affectionally known as ‘The Brig’ by the Doctor. His first encounter with the alien time traveller during Patrick Troughton’s run (the second incarnation of the Doctor) in 1968, battling the Great Intelligence and his robot Yeti in the London underground. After a few more appearances he became a regular character alongside Jon Pertwee during the Doctor’s exile on Earth. Nicholas Courtney playing The Brig became the longest lasting support character in the 50 year history of Doctor Who. After the Doctor broke his exile (as Tom Baker) Courtney was no longer a regular, but would return time and time again to meet with Peter Davison and Sylvester McCoy in the role of the Doctor. Following the death of Courtney in 2011, The Brig was retired from the show’s canon when the Doctor is informed on the phone about his passing. Most of the best known characters from the series tend to be the young companions played by Billie Piper, Karen Gillan and the like. In spite of his significance in the story the Brig has never gotten much fanfare. That’s one of the reasons it’s good to see this new series of novels expanding on the character. The first in a series, The Forgotten Son faces a couple of stumbling blocks in the opening chapters. It’s assumed that the reader is familiar with the events in Doctor Who leading up to this story. Make sure you’ve seen the ‘Web of Fear’ episodes before reading, as it will will clear up a lot of plot holes and give context for the events to follow. There’s a brief mention of a police box with an unconscious figure next to it, which seems needless. Even then it takes a while for the story to get rolling. We deal with a number of plot threads ranging from the Brig and his fiancee pondering the clash between personal and professional relationships to an undead soldier escaping from London. All the threads come together and the story gets rolling when The Brig arrives in his hometown trying to find his wayward mother (another thread). Here the Brig discovers that much of his memory of his early years are missing, and it ties into the return of the Great Intelligence. It’s at this point that the characters come into their own as the small town tries to discover the links between the invasion and an urban legend spawning out of the area. It’s a great sci-fi action story, perfectly suited to the Brig. 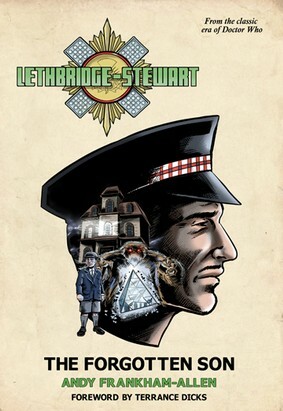 What makes it a real treat for fans of Doctor Who is how well it fleshes out Lethbridge-Stewart. The character was usually relegated to the straight man to Pertwee and Baker’s antics, left rolling his eyes in exasperation. Now he has a back story and his own set of motivations. This novel also neatly ties into some of current events in Doctor Who, with some of the Great Intelligences actions with the timestream having a roll back effect on this tale. Those who aren’t already fans of Doctor Who aren’t likely to get much out of this story. Instead they should go and become fans of DW (what’s wrong with you?!). If you want more of the Brig then this is well worth purchasing. We’ll be looking forward to the next part of this four part run! Category : Doctor Who, Geek Lit.